Exceeding Expectations Or Falling At The First Hurdle? As the dust settles on another World Cup campaign for at least another four years it’s time to reflect on whether England had an amazing tournament or whether they under-achieved. I stand on the touchline watching a match that would not have been played 50 years ago. You see the thermometer is reading -2deg C and there is 4″ of snow everywhere. That is everywhere but here. This is Ewood Park and the pitch itself is green and capable of taking a stud thanks to the undersoil heating system that’s been installed. My mind wanders and I think back to my childhood. Suddenly it’s Boxing Day 1962. I awake to a bedroom that has been rearranged into chaos, but it’s my chaos. On my bed there is a long woollen sock which yesterday contained some of the items now strewn around the room. Down at the toe end there is still an orange, a chocolate bar and some nuts. A Christmas stocking wouldn’t be complete without these items. The orange and chocolate would get eaten but the nuts I would return to the bowl downstairs. Does any 11 year old boy eat nuts? Still, it was a tradition, a ritual that my family and millions of others would perform every year. You may be poor but to get oranges, chocolates and nuts at Christmas you were a rich man indeed. I glance up at the football league ladders on my wall. Reading FC are in mid table in the 3rd division. Sundays were normally the day to study the newspaper and rearrange the little cardboard names on the ladders into their rightful position in each league. League ladder charts were the best free gift you could get from a comic. The only thing that ever came close was the cardboard triangle that sounded like a gun as you snapped it through the air, annoying any adult within hearing range. Dressed, my first job would be to check the Guinea Pigs in their hutch which had been moved to the relative warmth of the garage. They, or me were unaware that this winter was going to be different. This was the winter of 1962-63. This winter would devastate all sport. The racing stables of nearby Lambourne and East Ilsley would see the horses tucked up in their stalls for many weeks with no prospect of their next race and football would be almost wiped out for the next 11 weeks. Boxing Day saw 19 of the 46 Football League games postponed, with a further 3 abandoned. On December 29th the blizzards that had swept across Devon and Cornwall, fog covering the Midlands and the North, combined with bitterly cold temperatures down to -9deg C put paid to 26 of the 46 planned League games. By January 5th a slight thaw which had started in Europe had reached parts of the South, West and up to the Midlands, but came too late to save all but 5 of the 32 FA Cup third-round ties. On January 8th, the rearranged FA Cup ties would have to be postponed. The Guardian printed a wonderful photograph of Jimmy Armfield of Blackpool FC skating across the frozen pitch at Bloomfield Road. To date 145 out of 211 Cup and League matches had succumbed to the weather. During January I would build an igloo from 12″ thick blocks of snow and ice from our front garden. The igloo would stand until early March, giving many hours of play within its icy walls. Towards the end of January and through much of February the temperatures would fluctuate, leading to mini thaws in some parts of the country, leading to flooding. However these thaws would be short lived as blizzards would once more sweep the country and keep us all in an icy grip. John Samuel wrote on February 8th that 420 Cup and League games had been postponed in just under seven weeks. He estimated the total liability of the 92 clubs to be approximately £450,000, spread out in the form of overdrafts and FA and directors’ loans. Not a lot in today’s money but a small fortune in 1963. Undersoil heating was already known to be an answer to the problem of frozen pitches. The surface at Murrayfield had helped men with odd shaped balls to continue to play Rugby when others would have no option but to turn to indoor sports. This was achieved by electrical wiring laid under the turf. Everton were the first football club to use this method in 1957 during ground reconstruction but had to dig them up in 1960 when further drainage work became necessary. 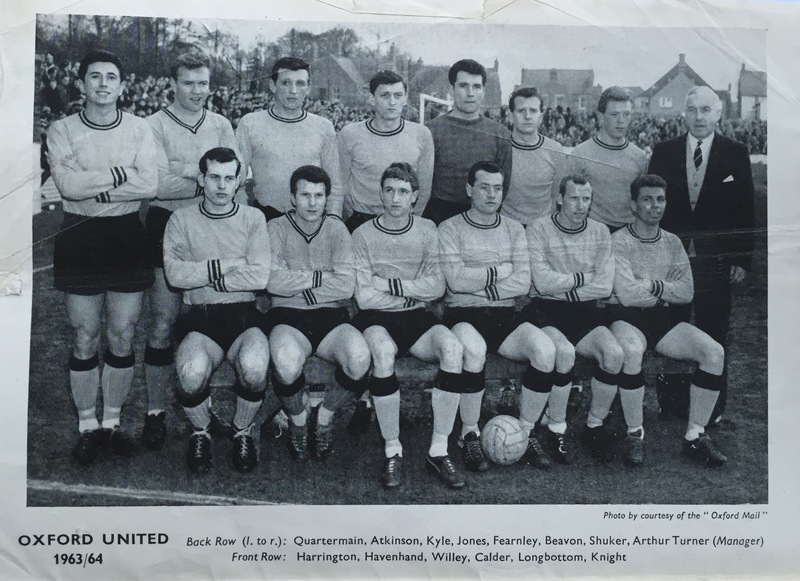 So during the winter of 1962-63 no club had heating installed. Mr W. Dickinson, the Everton secretary at the time said it had cost them around £16,000 to install, with part of this cost down to the need to install a separate sub-station from the floodlights to carry the load. They were planning to re-install the wiring during the summer of 63. The weekly wage bill stood at £1,200 for a staff of 50, including 40 professionals and apprentices. £700 had been spent on attempts to clear the ground of snow. Their only income was the £1,200 share of receipts from the Cup game with West Ham. Some took a longer term view of the lack of income by saying that the crowds would come back in greater numbers when the matches were finally played and this would ultimately be more rewarding than trying to get supporters to come through the turnstiles in bitterly cold weather. It would be the ninth week of this cold winter, on February 23rd, that more than half the Football League games would be played and the first time since December 28th that the football pools would operate without the help of the pools panel. March 2nd brought some good news for football fans in as much as only 14 Football League matches were postponed, the best Saturday in eleven weeks. Halifax FC were one of those postponed but the Shay ground was opened to the public as an ice rink, where hundreds flocked to take part. Whilst this brought in some welcome revenue it would not prevent them from being relegated to the 4th Division at the end of the season. The Football League ladders on the wall of my bedroom were not the only thing that failed to move during those 11 weeks. Shortly after Christmas we woke up to find that our water supply had frozen. The only option was to run a hosepipe from the house next door into our water tank in the loft. It would be March before the supply pipe could be dug up, only to find that it had been installed a mere 4″ below the surface. If you are off to a football match in the next few days make sure you wrap up really warm. Think I might take some chocolate and an orange too, but I won’t bother with the nuts. Have you looked at Rovers website lately? 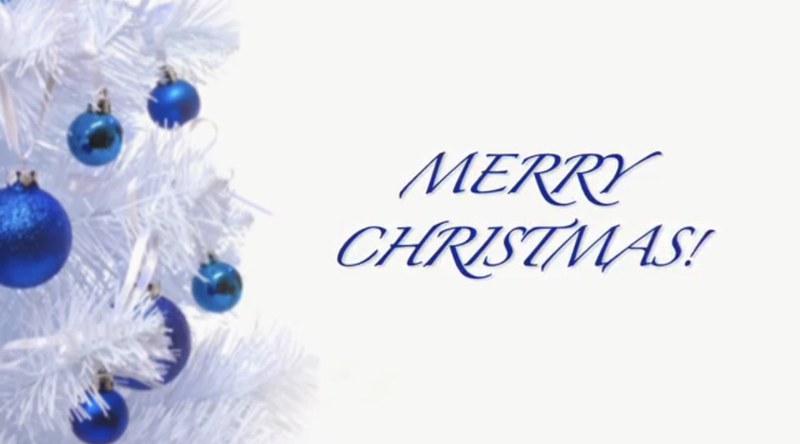 Maybe like me you were sent an email at Christmas with a message from the club to all their long suffering supporters. 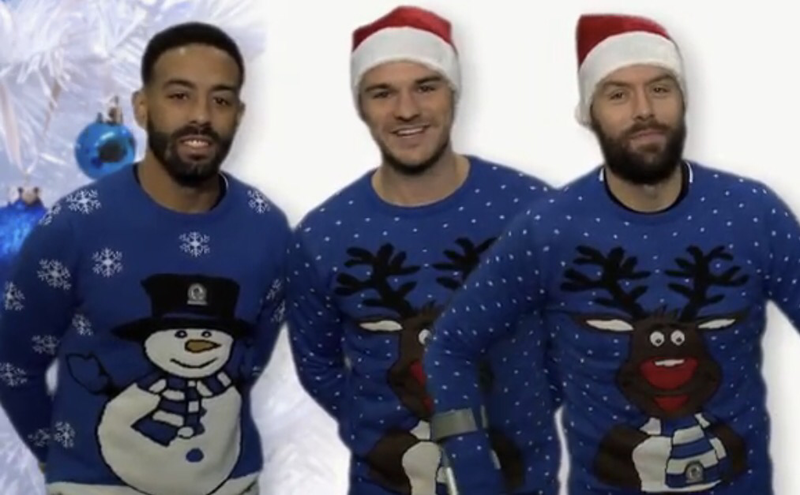 I thought we were probably in for a rare message from Pune wishing us all the best for our families and reminding us they will spare no expense in backing the manager with millions of pounds of transfer cash to spend in the January sales. All with the intention of propelling us up to the Premier League Title and a place in the Champions League where we belong. But no, the ‘Silence Of The Venkys’ lives on and is one day set to be made into a major film about the death of a once great football club, featuring a cast of clueless actors being badly advised by dark agents and chancers. 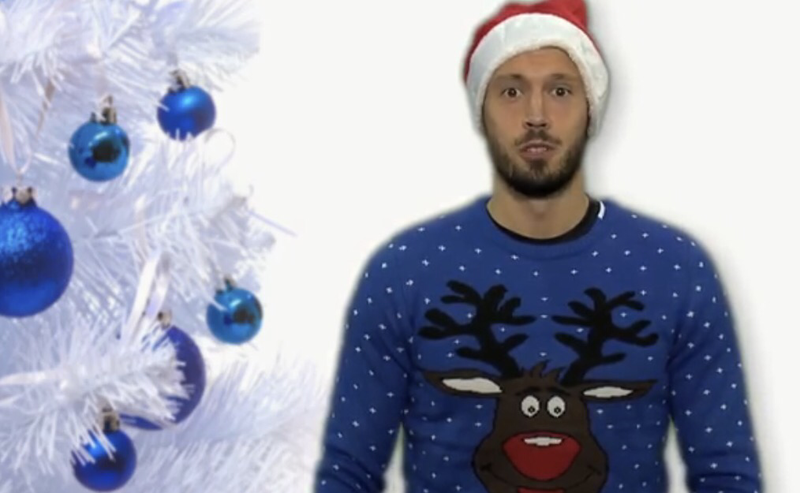 What I was treated to was the Christmas video by our players. 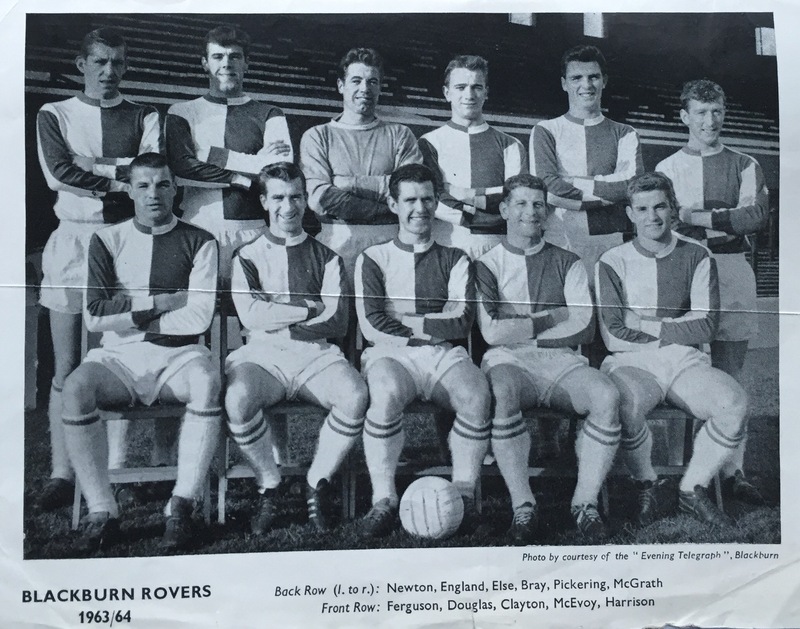 Now you may have read my blogs before and know me to be the ‘Victor Meldrew’ of football supporters but when it comes to supporting Rovers I’ve been doing it since 1978 as a season ticket holder so don’t talk to me about being a part-time supporter. I do watch Fylde, Stanley and the occasional Reading match when Rovers aren’t at home but I think I’m allowed that perk for putting up with the tripe I’ve had to watch from Rovers over the last six years. On 15th January 2012 I wrote a ‘letter to India’ which is documented in the archives of this site. I never did get that reply I was seeking. I didn’t get my postage back either. I shouldn’t be surprised because whilst I talked about the family that is Blackburn Rovers and the need for communication between owners and supporters, my plea was met by silence. Fast forward nearly four and a half years and see what has happened? We have seen a handful of managers, a shed load of mediocre players, and debt growing to £100+ million. This has all been done in ‘Venky Time’. Why do something today when it can be done tomorrow? Doubtless the chickens don’t complain so why should we? Well I’ll give you a reason. It’s because the s..t becomes that little bit deeper and harder to clean up with every day that passes. Chickens (and people) become demoralised and don’t perform to their best. Customers find what they are looking for with other suppliers. Sheds (and stands) eventually empty and businesses cease to be viable. So how can you reverse the downhill spiral? By making quick, but informed, decisions and acting on them today. You have no manager, just 16 players in contract and are taking a month to find a Communications Manager to replace the Communications Manager you put on ‘Gardening Leave’ a month ago. Now is the time to act to save this club from that downhill spiral or have we to endure another rollercoaster of a season ending in League 1 obscurity? Fast forward again to 13th October and it doesn’t have to be a Friday for number 13 to be unlucky. Despite a much improved performance in the last 3 games we still can’t win a match and remain bottom of the Championship. You can’t blame Owen Coyle for this mess. The players he has been able to bring in have mostly been ‘Frees’ and loan players, with his total spend of£250,000 for Derrick Williams against sales of Hanley and Duffy netting around £10 million. So don’t be too quick to berate Coyle for his poor start to the season or his former association with the Dingles down the road. There is no manager that could do more in these circumstances, even if you could find one that is daft enough to work under our absent owners. His cry for funds to be made available before the transfer deadline was met with the usual silence from Pune. I have no doubt we will turn a corner and actually win a match before long but whether it will be in time to make up points on those above us, only time will tell. What I do know is we must continue to make our voices heard to as many people as possible throughout the world about the disastrous and incompetent ownership by Venkys of our beloved Blackburn Rovers. It was good to see newspapers like The Times and The Times Of India taking up the story of their reign at Ewood again. I just hope Venkys finally talk to the supporters before this club implodes through criminal neglect and consider selling the club to someone who can reverse the decline as soon as possible. It’s been a while since we saw scenes like this at Ewood Park. A night when the place was buzzing and the terraces were full. You know something special is happening when the ground is surrounded by hawkers selling the mysterious phenomena that is the ‘Dual Scarf’. It’s the one that seemed a good idea at the time you bought it but you know you will never wear again. Maybe it’s designed for the households that support both teams, allowing it to be displayed above the tv in the living room as a constant reminder that rival fans can live together in harmony. 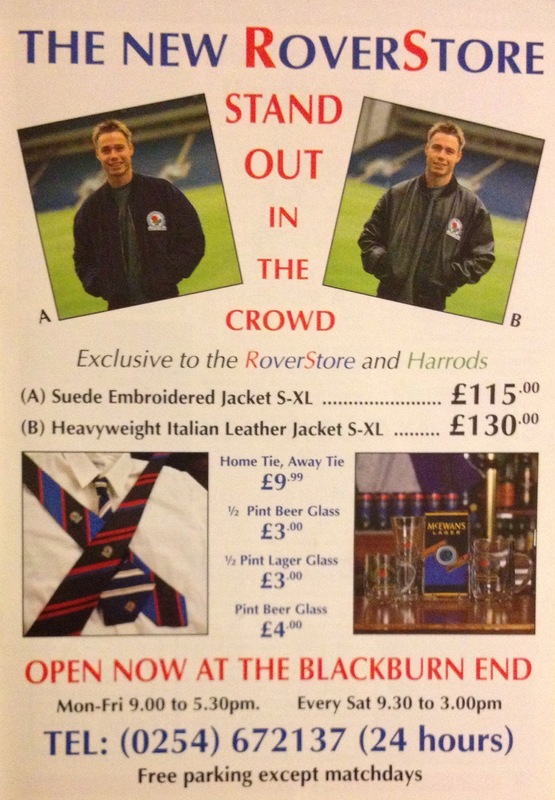 I wonder if the ones they don’t sell get cut in half and sewn together again for resale at their respective clubs? The night in question was the FA Cup replay between Rovers and Liverpool. The ground was packed, or as much as the police would allow, with people you had never seen before nor since. Late into their seats, if only they could find them. They all witnessed the best of Blackburn Rovers on a night when everyone shone brightly like the stars in the sky. Or was that from the drones? Now, a few weeks down the line and the season has come down to a last home game against Ipswich. Gary Bowyer will be packing his bags for Pune having prepared his presentation to Mrs D in the knowledge that Financial Fair Play will place a stranglehold on Ewood for some time yet. The reality of the situation is that when Rhodes and Gestede are sold, as they almost certainly will be, then we are left with a few good souls and a collection of ‘journeymen’ to keep us afloat in the Championship. There is no doubt that injuries have brought out the best in those who have stepped up to the task. Henley and Olsson have been great throughout the season but too many others have under performed. Cairney has too often been a lightweight in midfield, more concerned with keeping his hairstyle than getting stuck in for the team. The look that Rhodes gave him after he greedily went for the glory goal against Millwall rather than pass the ball, said it all. There’s no ‘I’ in TEAM. Marshall has had a very poor season, too often failing to get his crosses over, lift his corners or get his free kicks on target. Brown, we are told, has a ‘magnificent’ work rate and is a key frontman but you can’t help thinking that Bowyer is talking up his ability ahead of the inevitable departure of Gestede. My advice to Brown is to watch Rudi in training and try and learn how to win a ball in the air for once. Never mind we have still got Best around for another year on a reported £32,000 a week. Ask a Brighton fan what they think of him. That’s £1.664 million Rovers haven’t got in the next 12 months which could have been used to pay 10 youngsters with smaller egos and a real hunger for the game. So what’s the answer? Youth is the answer. O’Sullivan, Lenihan and Raya all need the chance to show what they can do. Gary Bowyer needs to sort out whether he wants Steele or Eastwood as 1st choice for next season and send the other out on loan. Raya for 2nd choice keeper would be my preference. There surely must be others in the under 21’s who would be eager to show what they could do without bringing in everyone else’s cast offs. How we need a ‘David Dunn’ to thread those passes through to the front two, whoever they may be next season. Cairney could do it, but without strong leadership and coaching you have to wonder whether he will. Oh for a strong, forward running, goal scoring midfielder to emerge from the ranks to supply the forward line with a few different goal scoring options. This has been a poor season for home supporters. The 12-13,000 crowds officially reported are clearly not really there, as I presume season ticket holders are counted whether they attend or not. Those that only came to see the Liverpool game have no idea what this team has been like over the rest of the season. So many games to forget. So many opportunities missed. Now it’s time to cast off the expectations of a return to the Premier League in the near future and get back to basics with players that are hungry for the chance to play football. Give youth a chance and we may all be surprised. Today we hope to see a really big crowd just like the Liverpool game and David Dunn on the pitch for some part of the match to give him the send-off he deserves. I’m hoping that he plays for Accrington Stanley next year; that he gets his coaching badges and maybe just maybe comes back to Ewood as part of the coaching staff. Would it be too much to hope that he might make a future manager of Blackburn Rovers? Let’s hope that Rovers can get back to the future with big games, big crowds and top flight football. P.S. I’m pleased to report a home win 3-2 over Ipswich watched by nearly 17,000 fans (approx 2,000 from Ipswich). After going behind to a Murphy goal in the 2nd minute Rovers finally hit back with goals from Rhodes, Conway and Gestede before Murphy converted a penalty near the end. However, both sets of supporters went home happy as Ipswich are in the play-offs with a game against local rivals Norwich to look forward to. As for David Dunn, he proudly wore the captain’s armband and showed us just what we will be missing next season with some superb forward balls and passes. It was no coincidence that Rovers seemed to lose their way when left the field. He richly deserved the applause he got on being substituted and again during the walkabout. “In all planning for this match the City Engineer and City Police have given all possible advice and assistance and our grateful thanks goes to them for their co-operation in all details and I appeal to all spectators today to co-operate with the police and stewards to pack themselves in as closely as possible, do not forget that an empty space or terrace anywhere will mean that someone, somewhere, on the ground is having to struggle to see, it may be one of your friends. How times and attitudes have changed since 1964. Oxford United sit mid-table in the Fourth Division. Their captain today is the now legendary Ron Atkinson. Success today would likely bring another record crowd should they get a home draw and with it the honour of being the first team from the Fourth Tier to reach the FA Cup Quarter Finals. 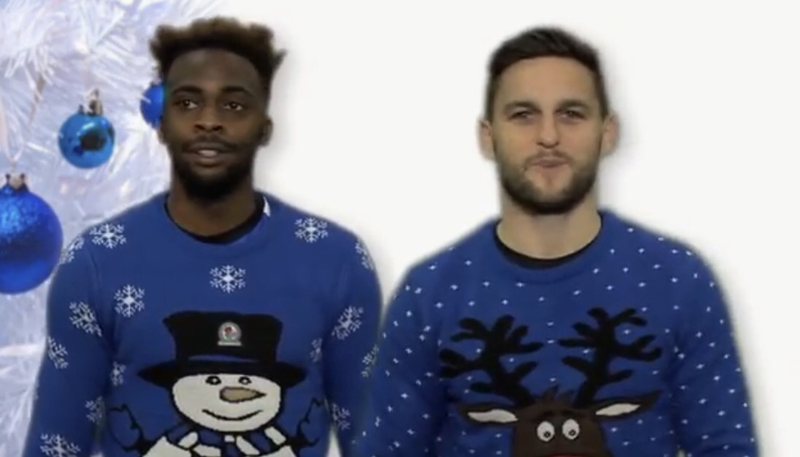 Blackburn Rovers are currently in 2nd spot in Division 1 and bring with them experienced International players from England, Wales and the Republic of Ireland. A record crowd of 21,700 supporters have ‘packed’ themselves into the Manor Ground. Oxford open the scoring after 13 minutes with a goal from Tony Jones and the home fans go for their Bovril at half-time satisfied with the 1-0 scoreline. Jones gets his second goal early in the 2nd half to send the fans wild before Ferguson, signed from Accrington Stanley after their resignation from the Football League, scores on 68 minutes. 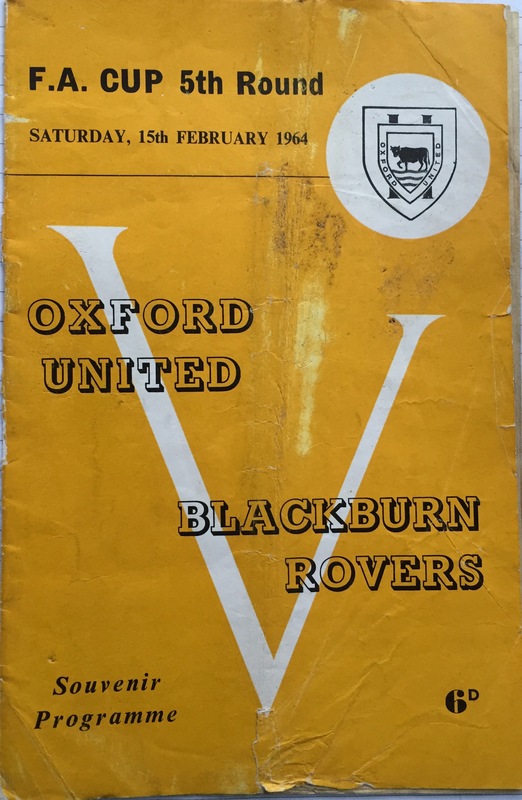 However, Oxford are not to be denied their famous victory over a team at the top of the football pyramid when Billy Calder scores Oxford’s third in the closing minutes. The game ends 3-1 in favour of the home side. At the final whistle there is a huge pitch invasion and captain Ron Atkinson is carried off by the fans. He is described in the media as a rock in defence. The Quarter Final draw brings Preston North End to the Manor Ground to occupy those terraces that Blackburn helped to pay for. This time the ground record was again broken by a crowd of 22,750. Unfortunately Oxford could not repeat their giant killing performance and Preston ran out 2-1 winners. This season our season ticket books are pink, our seats are shiny new and Blue, we have reasons to be confident that this will be a season to remember. 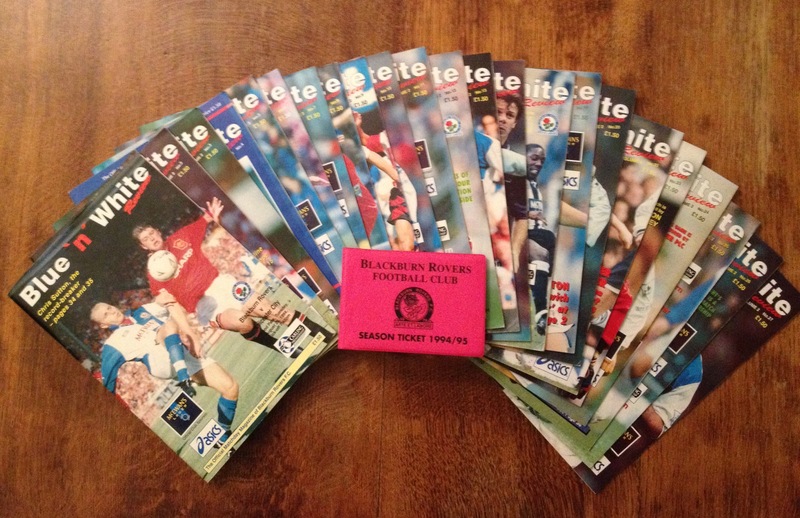 This is just one supporter’s view with the help of the programmes he bought at every home game during the 94-95 season. Today’s cover picture features Robbie Slater who is one of the new boys this season. He joined Rovers from French club Lens just before the start of the season for £300,000. Robbie was born in Ormskirk but emigrated to Australia when he was just 18 months old. He’s now an Australian International but always wanted to play in England. Looks like a smart decision to join Rovers. I can just manage to afford the club tie at £9.99, maybe the corporate boxes will snap them up. Kenny Dalglish, in his programme notes, is rightly proud of the start that Rovers have made at home with 3-0 and 4-0 wins. He also praises the away fans at the Arsenal game, where Rovers had to play most of the second half with 10 men after Jason Wilcox was sent off. There are photos of the 4-0 demolition of Coventry City where new boy Chris Sutton claimed a hat-trick and Jason Wilcox also got on the scoresheet. I get the feeling there’s a lot more to come from this team. 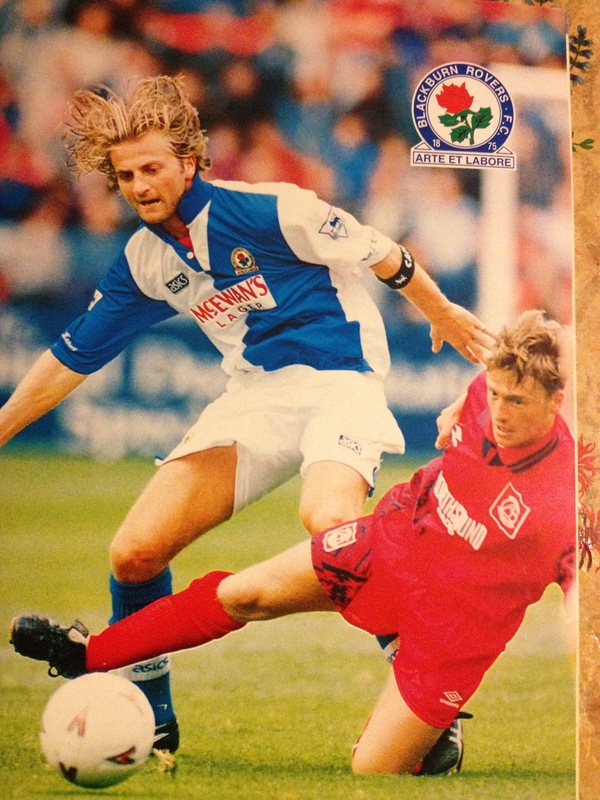 Today’s Ewood Hall Of Fame features Bob Crompton. 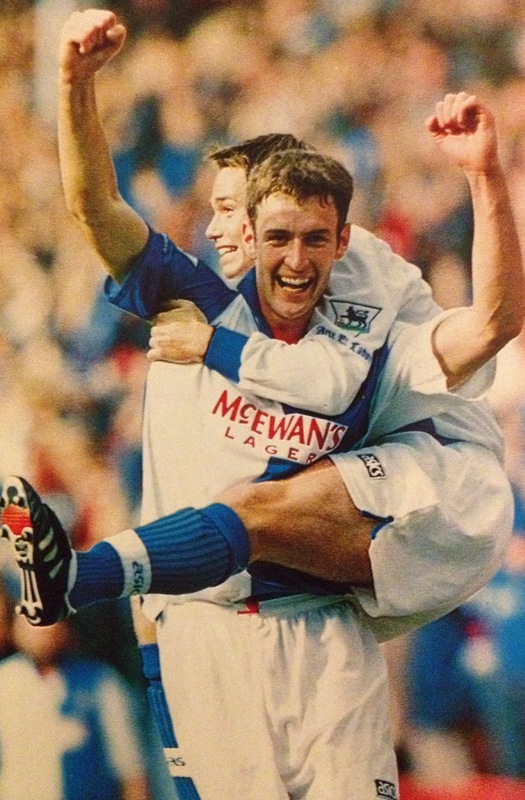 He made 529 League appearances for Rovers, scoring 14 goals, in an incredible career which spanned 23 years at the club. He was born in September 1879 and made his first appearance in 1896 at the age of 17 away at Stoke. His final game as a player would come at Bradford Park Avenue in February 1920. 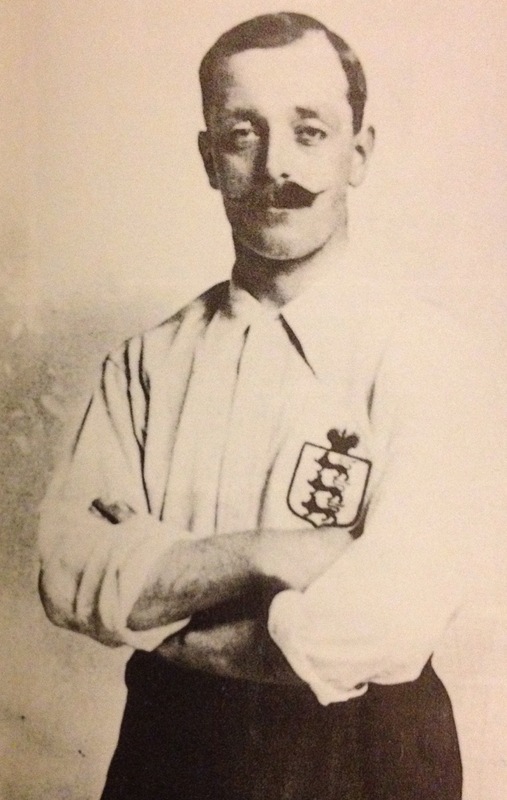 This outstanding full-back made 41 international appearances for England between 1902 and 1914. Captaining his Club and Country would prove to be only a springboard to further success. He became a director of the club and then honorary manager in the mid 1920’s. His 1928 side won the FA Cup, the only medal that eluded him as a player. He had a short spell at Bournemouth but returned to Ewood in 1938 to save Rovers being relegated to Division Three. He sadly died in March 1941 aged 61 but his memory will live on as one of the ‘Greats’ in football for Club and Country. 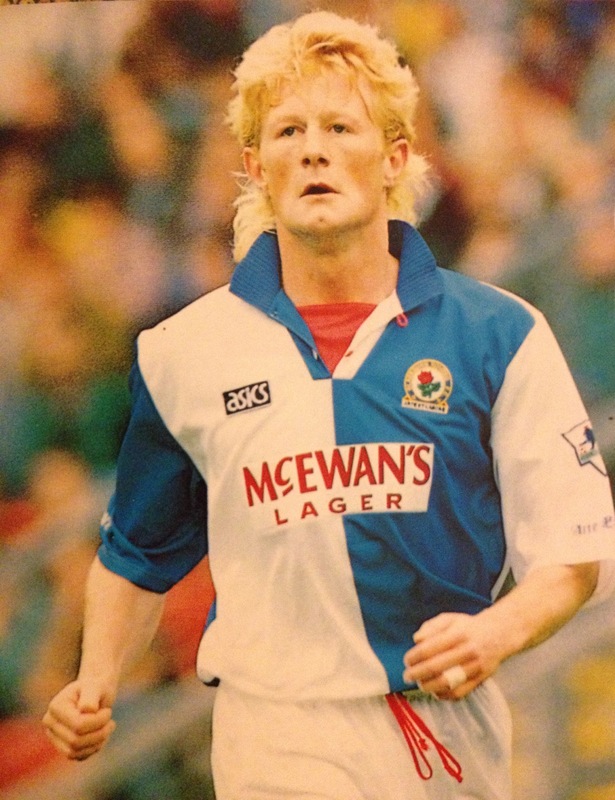 Colin Hendry features in today’s programme where he talks about “taking one step backwards to take two steps forward”. He initially joined Rovers in March 1987 from Dundee and then manager Don Mackay had to hand over all his transfer funds of £30,000 and agree that they would get a percentage of any future transfer profits. Although he moved on to play for Manchester City for two years he jumped at the chance to return to play for Kenny Dalglish and a club where he was already a legend. ‘Braveheart’ could always be relied upon to put everything on the line for the team, as demonstrated 10 days earlier in the game against Arsenal at Highbury. Today’s opponents, Everton, arrive with just 1 point on the board and have so far failed to get started in the league. Manager Mike Walker made only one new signing in ex Spurs midfielder Vinny Samways. My programme also features Swedish International winger Anders Limpar who arrived from Arsenal last season for £1.6 million. 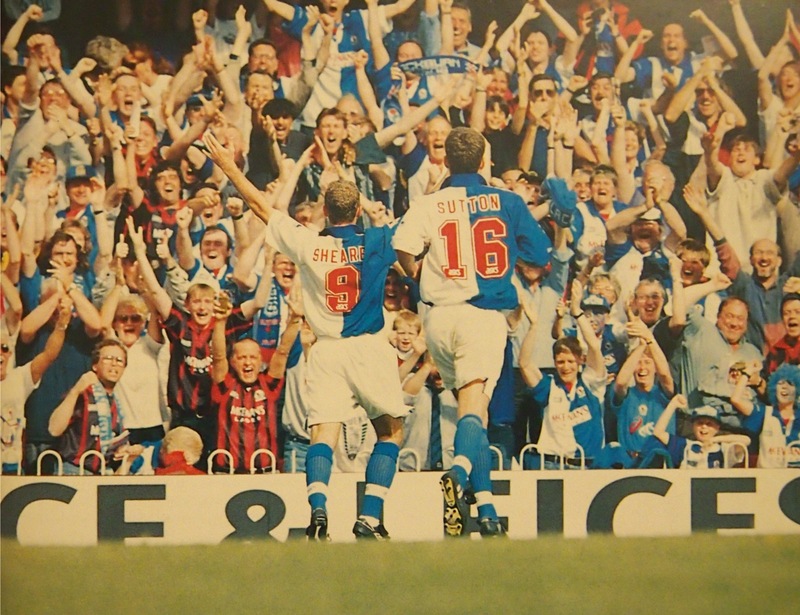 The crowd is big today, swelled by a large away following, there are 26,538 at Ewood to see us win comfortably 3-0 thanks to goals from Shearer and Wilcox in the first half and a penalty from Shearer in the 2nd half. We now sit 3rd in the table behind Newcastle and Nottingham Forest, on 11 points. Today we are back in action against Coventry City; a team that, despite a number of relegation battles, have enjoyed 27 years in the top flight. Their biggest success in recent years was an FA Cup triumph over Spurs in 1987. My programme tells me their biggest defeat was a 2-11 thrashing by visitors Berwick Rangers in the FA Cup 1901. Coventry were known for their frequent change of management. Phil Neal had been handed the hot seat last season after Bobby Gould, walked out following a heavy defeat at Queens Park Rangers. 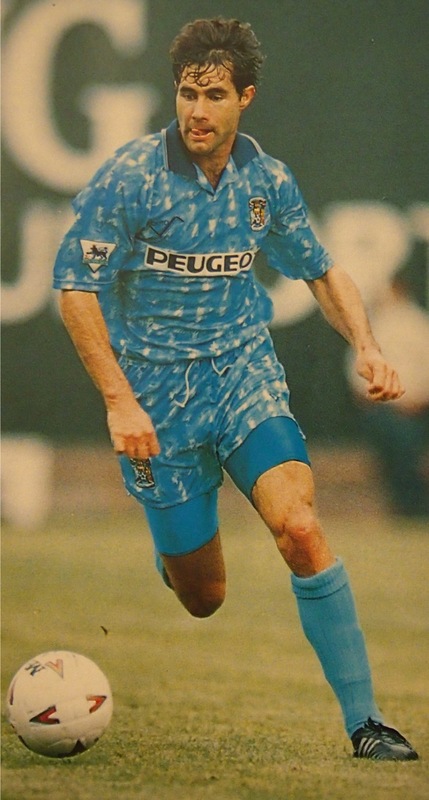 Former Rover Roy Wegerle returns today as a City player. 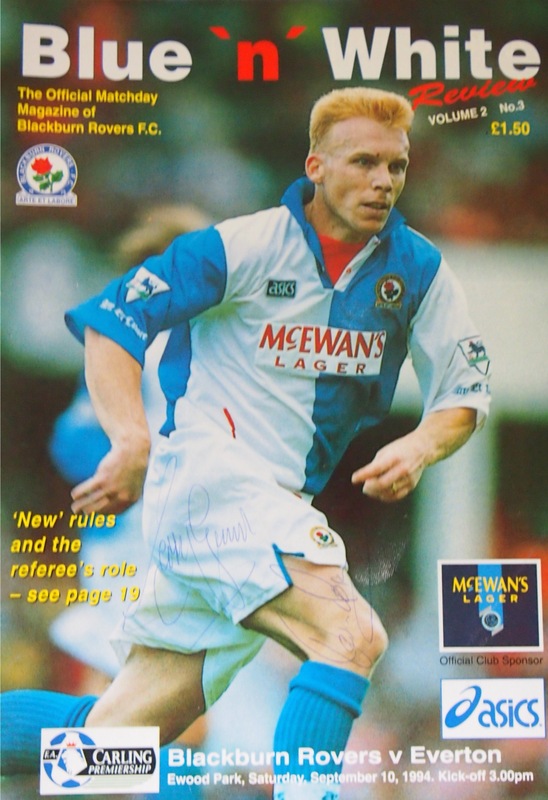 He was transferred to Coventry with Kevin Gallacher coming coming to Ewood. Today Kevin is still recovering from a broken leg so we will need to get the best out of Shearer and Sutton up front. Another City frontman is Mick Quinn, a player who whenever I see him always reminds me of Bob Carolgees. 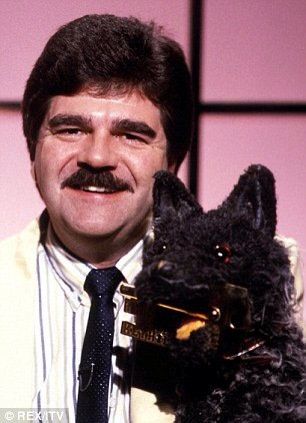 Younger readers will say “Who?” However, if I said ‘Spit The Dog’ then anyone over 30 would probably remember the furry puppet with the unfortunate habit that made him a TV star in the 80’s. 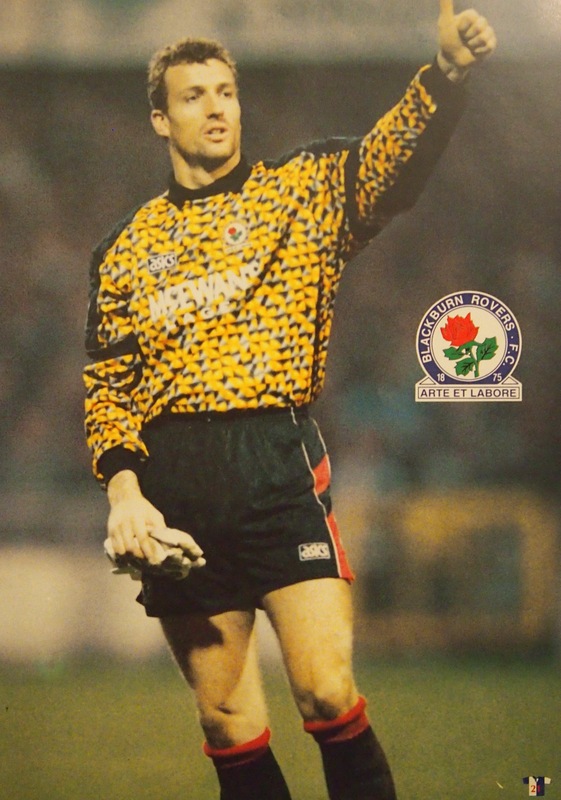 Someone else with a Coventry connection is Tim Flowers who used to stand on the terraces as a boy at Highfield Road. He arrived from Southampton last season for a £2 million fee which was a British record for a goalkeeper. Today’s Ewood Hall Of Fame features Bill Eckersley. 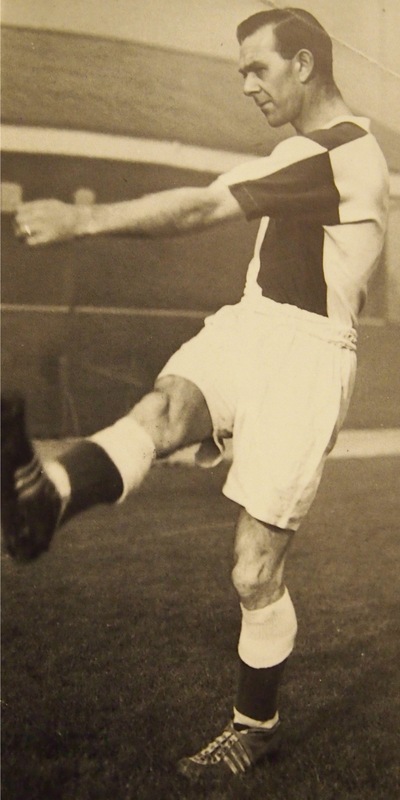 The right-footed left back made a total of 406 League appearances, scoring 20 goals in his time with Rovers between the 1947-48 and 1960-61 seasons. He was also capped 17 times for England, often forming a full back pairing with Alf Ramsey. He was one of the smallest and lightest full backs to play international football but was recognised for his clean tackling and powerful kicking. He suffered knee problems during his career and finally retired from football at 35 years of age. He was just 57 when he died, but the former lorry driver from Southport will always be remembered as one of the post-war greats for both Club and Country. Amongst the photos on display in this programme are shots of our opening game of the season at Southampton. I like this one of the SAS celebrating with the away following. ….And today’s game? A stunning hat-trick for new boy Chris Sutton and one from Jason Wilcox sees us go home happy 4-0 winners with a crowd of 21,657 and 2nd in the table. 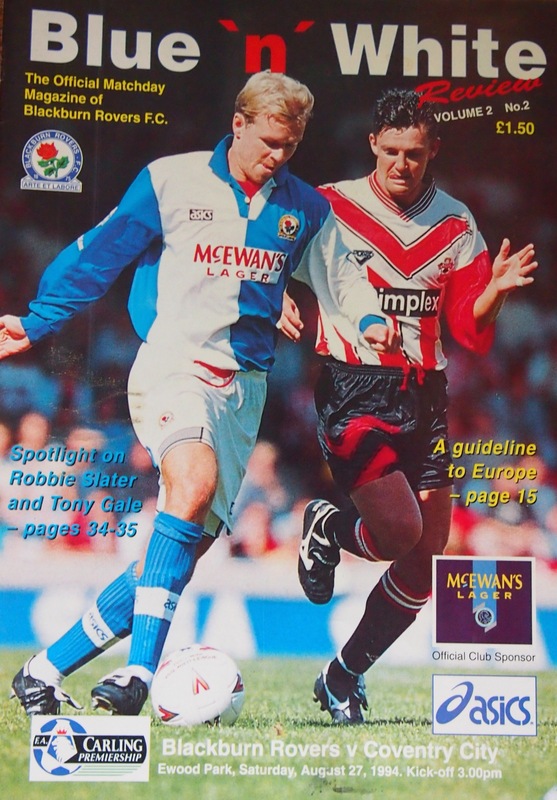 In 1994 £1.50 buys you a Rovers programme. Something to flick through while you’re waiting for the game to start. Give it to the kids to collect a few autographs and maybe to look at when you get home. Tonight’s edition is packed full of the positive thoughts of manager, staff and players who are still riding high after finishing 2nd in the Premiership last season. 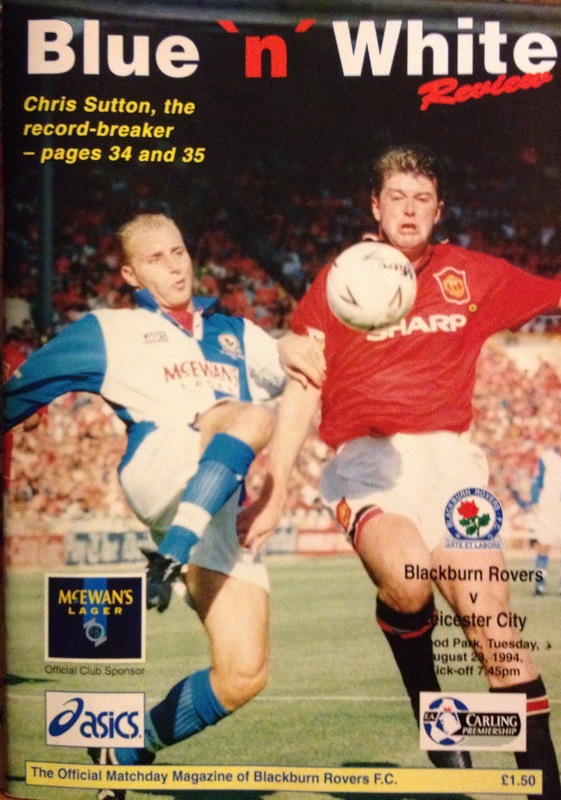 The cover features Stuart Ripley and Gary Pallister battling for possession during the Charity Shield game at Wembley. We lost the game against Manchester United 2-0 but it was a great day out with over 20,000 Rovers fans making the trip. We learn in the programme that Kenny Dalglish and the players had surprised Jack Walker by asking him to lead the team out at the start of the game. 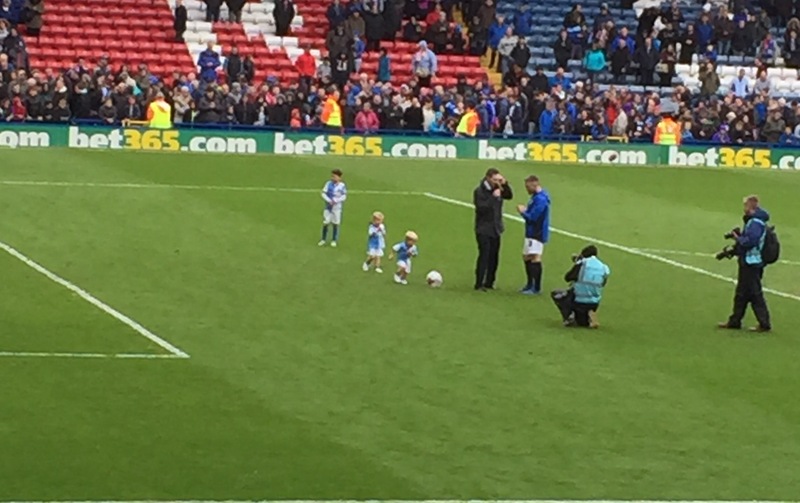 It was a fitting tribute to the man who has given so much to this club. 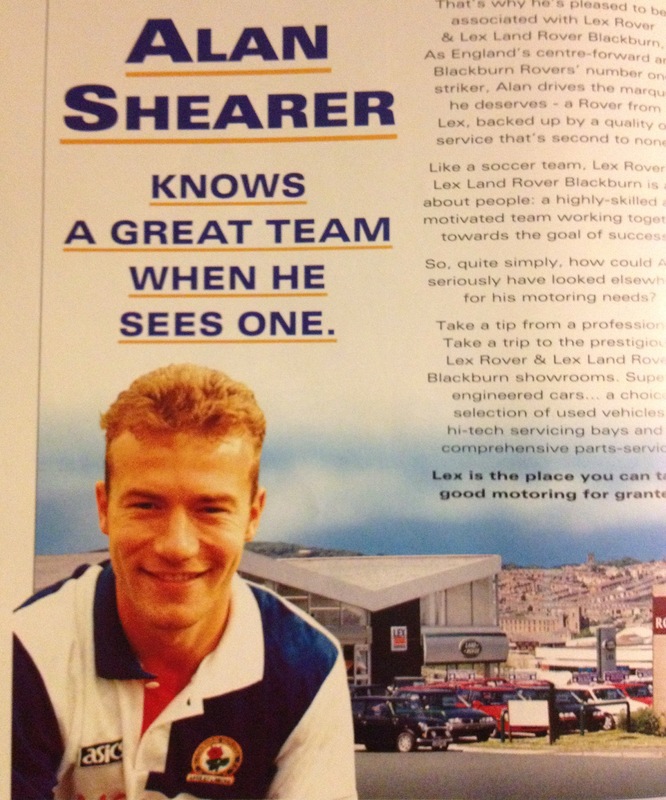 Alan Shearer appears in an advertisement for Lex Rover sporting a great head of hair. Where’s it gone now Alan? Someone else with a full ‘Barnet’ is captain Tim Sherwood who looks like he was wired up to the electric socket before the game. 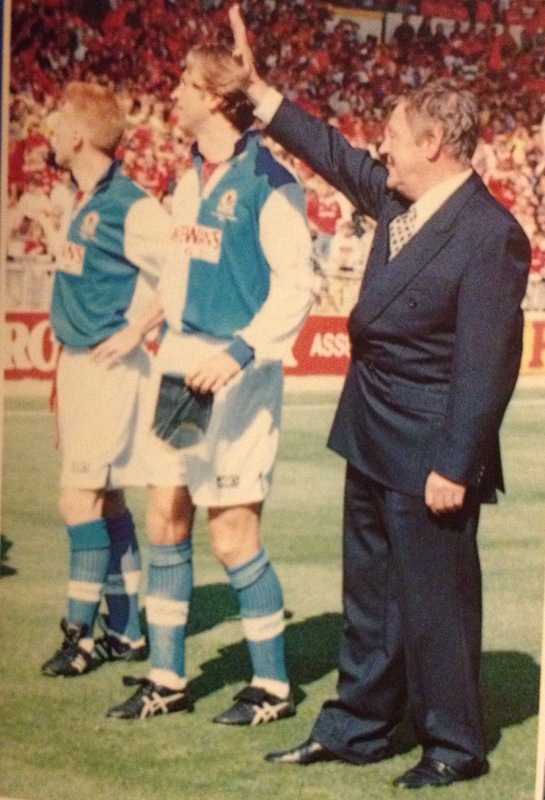 There is a section entitled Ewood’s Hall Of Fame which this week features the great Bryan Douglas. The Factfile shows he made a total of 438 League appearances for Rovers between 1954 and 1969 scoring 101 goals. Some achievement. 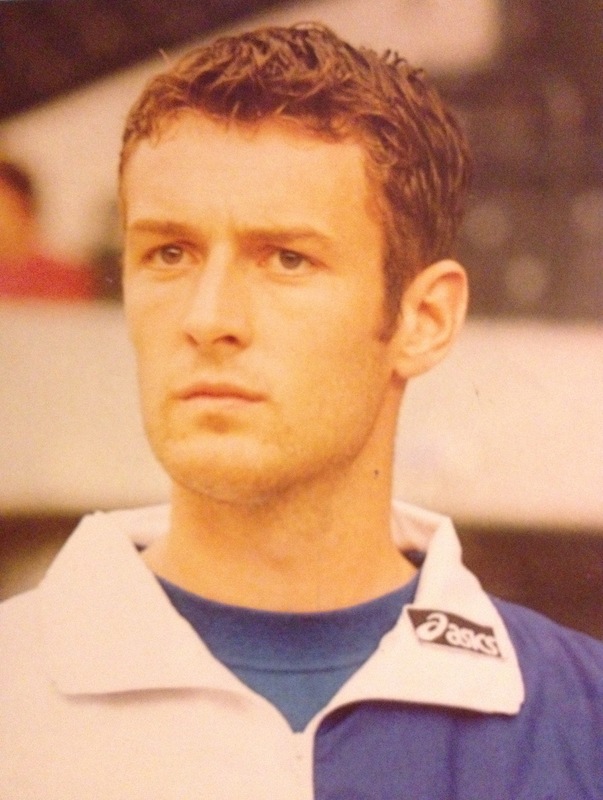 The big story centred on the new boy in Blue & White, Chris Sutton. He had arrived a month earlier and gone straight into the record books by smashing the record for a transfer deal between two British clubs. £5 million for the 21 year old from Norwich City. We didn’t know then that he would go on to form the deadly SAS partnership with Alan Shearer. 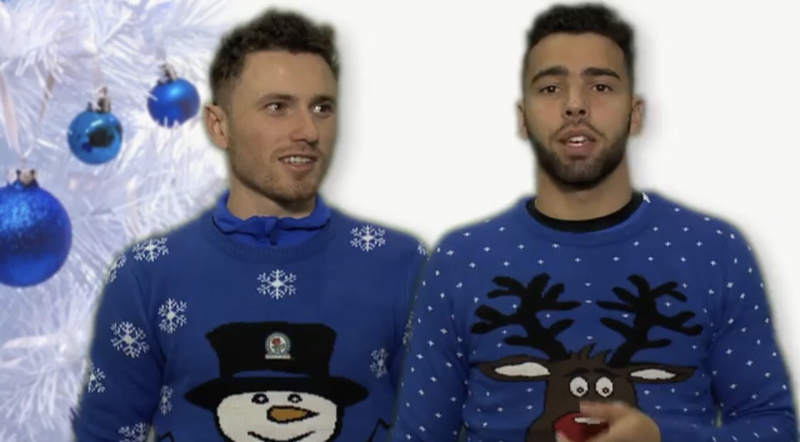 The Summer Diary gives snippets of news about players and goings-on at Ewood. We learn that Colin Hendry, Tim Sherwood and Jason Wilcox have all signed new contracts and that Kevin Gallacher is making progress after breaking his leg at Highbury last season. Time now to enjoy tonight’s game against Leicester City, and enjoy it we do as Shearer, Sutton and Berg all get on the scoresheet in a 3-0 win. Sutton had made an impressive debut in our first game at Southampton, providing the ‘assist’ for Shearer to score in a 1-1 draw. Tonight it’s Shearer’s turn to provide the cross for Sutton to get his first league goal in a Blue & White Shirt. All in front of a 21,050 crowd. Now we’re really looking forward to Saturday and another home game against Coventry City.